The following post is an interview I conducted with a fellow Yen Press Talent Search finalist, Lily Cernak. I decided to be a little proactive and feature other artists from that first search on my blog since I think they still deserve to have a spotlight shone on their hard work. This was quite fun and I hope to be able to do the same for other artists and future finalists. Online I usually go by Rain-and-Sunshine (deviantArt) or Rainysidewalks (other places). I am a studio artist at the GoggleWorks Center for the Arts in Readig, PA. Aside from my art-work I also work as a Japanese language and manga/graphic novel/comic drawing instructor (I also teach long distance!). My first introduction to manga was as a small child looking through Japanese kiddie magazines, and I’ve been hooked ever since. I’ve always felt drawn to the dynamic characters and graceful beauty of manga. The really skilled artists can just pull you into the flow of the story, as though you are watching a movie. And even quiet or action-packed scenes and panels are often arranged just so, so that they are beautiful all on their own. That is the kind of story I want to create. I totally agree with you on manga being very cinematic! The way some artists portray moment to moment transitions in their panels feels like individual frames of a movie when you’re reading it and the particular way they are composed on the page can often be a unique visual experience on its own. If you don’t mind me asking, what are your duties as a studio artist? Do you all work together on one kind of project or different kinds? It’s just fascinating to me how comic artists can come from different kinds of backgrounds. Each artist at GoggleWorks has an individual studio (although some artists share — for instance, I share my studio with my father Alan Cernak) and for the most part each artist works on their own projects, but occasionally artists do collaborate on artwork or organize shows together, etc. I often collaborate with my father on multi-media projects and sculptures (his work and our collaborations are at alancernak.com)! Who are some of the artists or what are the works that have inspired you? Manga and non-manga are okay! Wonderful! I love them both as well. Takaya’s Fruits Basket just so happens to be a primary inspiration for Polterguys and Arakawa’s style and storytelling skills are so strong and appeal equally to both genders. She is one of my artist idols as well. Oh wow, Scott and Tolkien! That’s some heavy-duty genre stuff. What about their books are you drawn to as a storyteller? One of the marks of a great author is the ability to cause the reader to fall in love with their characters, I think — both the heroes and the villains! I find both Tolkien and Card very interesting because while their writing is in some ways very “blunt” by some current standards (not a lot of emotional or physical description, for instance) you very quickly develop a deep feeling of connection to their characters, and their stories keep you thinking long after you finish reading. They also both put an incredible amount of themselves into their work — creating not just characters, but a whole world that is so complete, you feel it must really exist. That was also one of the things I loved about Fullmetal Alchemist, actually — the whole story was just so well-thought-out and so well interconnected within itself. My Talent Search entry from last year was called “What I Found at the River” and can be read here on Smackjeeves. When a little girl is sent down to the river near her village on an errand, she finds a little more than she bargained for — and with the help of her overactive imagination, the trek home turns into an adventure of epic proportions! It’s quite charming. 😀 Bryn is such a great character – so plucky and determined. How did you come up with the initial concept for the entry? Was it an idea you had before or did it come to you after some time? Thank you! To be honest I don’t remember where how I came up with the initial concept…I just remember that I knew I wanted to do something really different, and that I wanted to do something set in another world. Most of my stories, even the fantasy ones, are set on “earth” and involve teens or young adults, so for this story I decided to write about children. In my opinion, creating a short story is much harder in many ways than a longer, chapter- or episode-based story. I feel I learned a lot about my “style” as an artist and also about effective/efficient story scripting from creating this entry. My advice is, be careful with your pacing. You want to give your characters room to develop and to interact and get the reader feeling involved without anything feeling rushed. Who are they, what do they want, what is stopping them from getting it, and why do we care? You only have a relatively small number of pages, but within those pages the reader still needs to finish the story feeling a real connection to the character(s) and feeling that the story was told to completion. I definitely agree. I think beginning artists make the mistake of trying to tell longer stories because they don’t want to think of the entire story as a whole. This is is why I think starting with shorter stories actually helps us grow as writers. They are more challenging but you can learn a lot by taking them on. You mention learning more about your “style.” Can you expand on that a little? I think personal style is something we, as artists, all struggle with and I’m curious to know what you thought about. What did you think about the talent search in general? Did you find the feedback helpful? I thought the search was (and is!) a great opportunity for all of us, and I’m so glad Yen Press is doing it! The feedback was indeed helpful. That’s good! I thought there were some bumps along the way (like a very long undetermined waiting period after the deadline) but they may have been overwhelmed by so many passionate entries and it also was their first time after all, so it’s quite understandable. Off the top of your heard, is there anything you can suggest they do better this time around or for future rounds? I really would have liked to see all of the “finalist” entries. I can certainly understand that Yen Press wouldn’t want to necessarily print an anthology of the entries or anything like that (expensive! ), but a having a website specifically for the Talent Search where the finalists could log in (maybe with a password YP provided?) and upload their work would be interesting. Several projects, in fact! I am still working on my webmanga Farewell Feeling, as well as another comic for Thejapanesepage.com called Yuki no Monogatari and a few other things. Also, in October my father and I each painted a large mural as part of the “Hello! 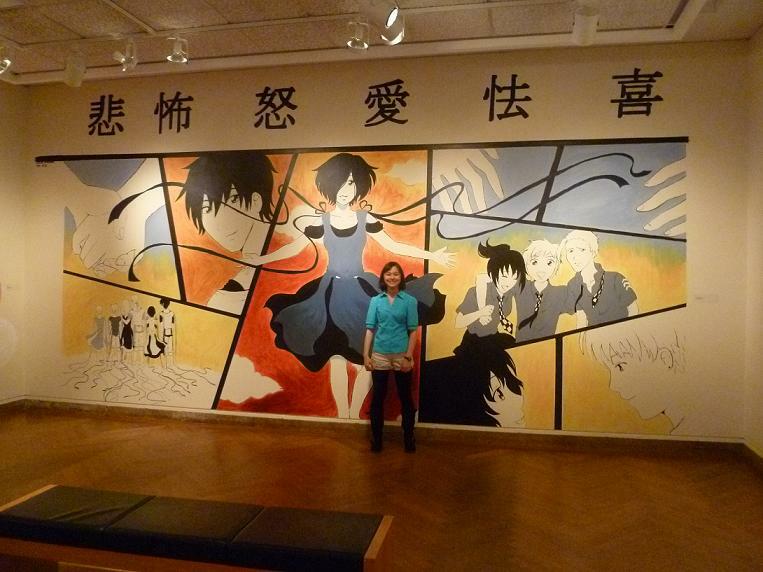 Manga” exhibit at the Lyman Allyn Museum in Connecticut (the exhibit ran until a few weeks ago). WOW, that is just amazing! Did you have any photos of the mural? I’d love to share them. I sure do! here is a link to the one I have up on my deviantArt.